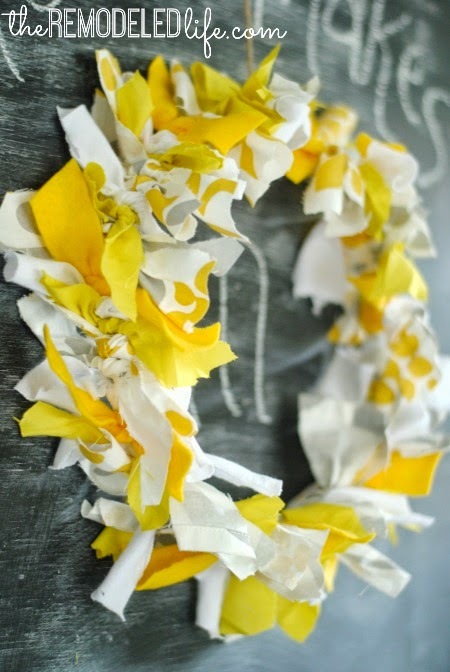 Today I'm sharing with you a super simple wreath tutorial! 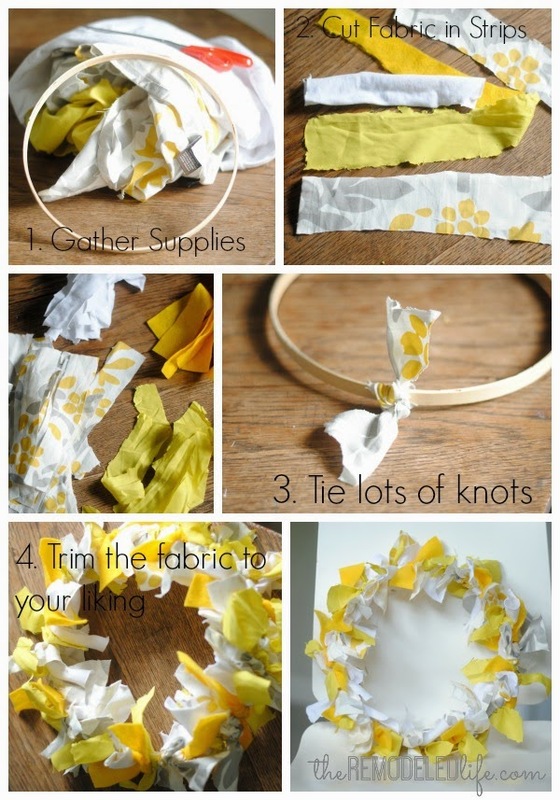 It involves cutting, tying knots and using mostly items you probably already have- so anyone can do this. 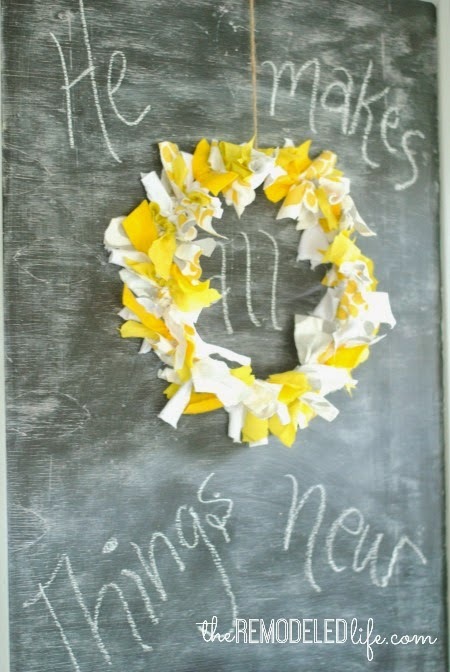 I needed some spring color to brighten up our home so yellow is what I went for, I love the bright pop of color! Ok, let's get started.. The first thing you need to do is gather your supplies. I used an embroidery hoop for my wreath base. If you don't have one already they are super easy to find - either at your local craft store, walmart and even target now has them and they are usually under $2. Next you need to decide on fabric. I used all scarp items like an old table cloth, sheet and t shirt. I also used some yellow felt I already had on hand. Just use what you have! It really is just as simple as cutting strips of fabric...and they don't have to be perfect (obviously from my photo) and tying the strips in knots around your hoop. 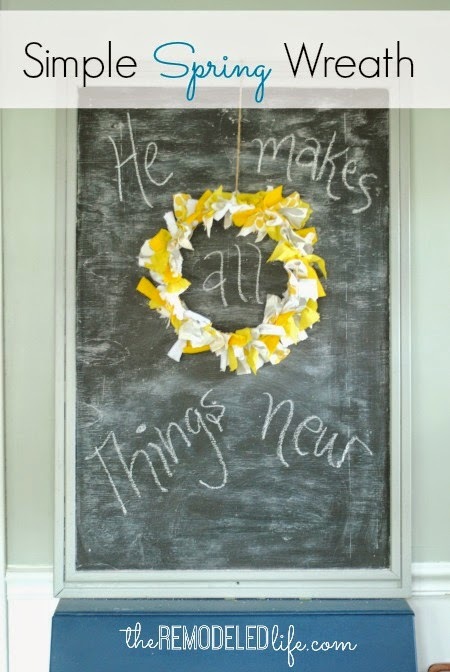 After you have it all tired I usually grab my scissors and trim around the wreath to make it a little more even. So easy and sweet! I love using things I already have on hand to make something new. If you didn't have fabric you could also use ribbon or burlap...or old t-shirts like I did. The most difficult thing about this wreath is probably the time but I got mine done in under an hour and all while watching HGTV of course...not too bad.